The Porters of Hellsgate have announced the cast for Troilus and Cressida, Shakespeare’s rarely produced and beautifully diverse “problem” play, to be directed by Charles Pasternak. 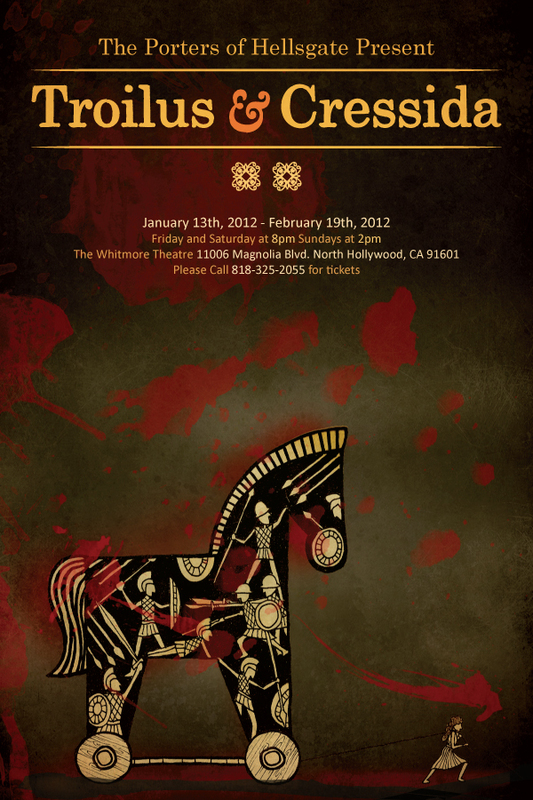 The play opens The Porters’ sixth season and runs January 13 – February 19, 2012 at The Whitmore Theatre in North Hollywood. Leading the cast are Alex Parker and Taylor Fisher in the title roles. along with Jacques Freydont (Pandarus), Napoleon Tavale (Hector), Jesse James Thomas (Paris), Sean Faye (Helenus), Tim Portnoy (Aeneas), Kate O’Toole (Cassandra), Dana DeRuyck (Andromache), Andrew Herrera (Agamemnon), Eddie Castuera (Menelaus), Eliza Kiss (Helen), Matt Calloway (Achilles), Dylan Vigus (Ajax), Thomas Bigley (Ulysses), John Moskal (Nestor), Adam Schroeder (Diomedes), Frederick Hamel (Patroclus), and Gus Krieger (Thersites). Understudies are Christina MacKinnon (Cressida) and Sean Faye (Thersites). The Greeks, in a quest to regain the beautiful Helen, have been encamped on the beach of Troy for seven years with no exit strategy, and no plan to form one. Discontent and disunity rages among their camp, while Hector, eldest prince of Troy and commander of its armies, continues to defeat them in the field and hold them to the beach. The Porters focus on the cyclical nature of possession and lust, centering on an exploration of value, the endeavor for honor and eternal canonization, and the furious discussion that rages within even the warring nations of today — what is worth fighting for? What is worth dying for? The Whitmore Theatre is located at 11006 Magnolia Blvd, North Hollywood, CA 91601. Click Here for tickets. www.portersofhellsgate.com.